Vacation breakfast that is easy to pack and delicious to eat. Simple, light start to a busy beach day. Breakfast should have 3-5 food groups. This could easy have fruit added to it, but I knew I’d be snacking on grapes while enjoying the sun and waves so I held off on those this time. Alternative: This would also make a killer snack (pre/post) workouts. Sausage balls are one of my weaknesses. Dang, they are delicious!! And sausage balls are my go to when partaking in a potluck breakfast. As good as they are, if you’re trying to manage your weight or health, you need to be mindful of the amount you just pop, pop, pop, into your mouth. While sausage balls do have some protein in them, they have more fat per serving. Pairing it with a Greek yogurt which is packed in protein and a fruit balances it out. *Remember, Breakfast needs 3-5 different food groups to be balanced. New find, New favorite. Who said bagels couldn’t be protein (and fiber) packed? Zero affiliation with any brand shown, like Dave's Killer Bread, but digging their products. This bagel has 12 grams (plant based) protein + 5 grams fiber. Score! Pair it with a peanut butter and a banana and glass of ultra filtered, protein rich milk and you hit a home run for breakfast! 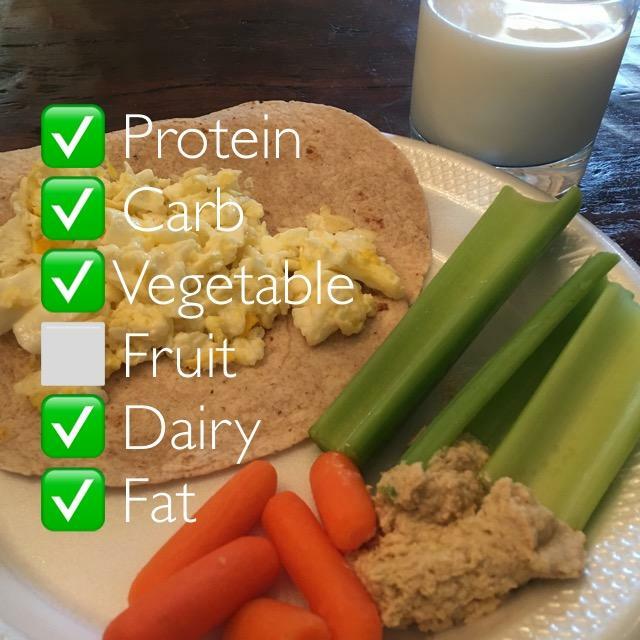 Rate Your Plate - a few of my favorite things brought together for a powerful, protein packed breakfast (pre or post workout meal or dinner when you don’t care, but still care). Protein checkmark is dimmer because the protein is nicely packed inside other food groups. Carbs come from Vans Power Grains waffles (10g pro) whole grains. No vegetable, but a banana for the fruit group. Dairy is obtained with ultra filtered milk (20g pro) no added sugar, no fat. Fat is from the peanut butter. (Remember, PB has more fat grams than protein grams, making not the best protein only option). Breakfast needs 3-5 different checkmarks. I have zero affiliations with these brands. Rate Your Plate - a balanced breakfast contains 3-5 different food groups. This balanced breakfast takes under 5 minutes to make and will keep you full and satisfied for hours. *Zero connection to the brands shown. That’s a mound of egg whites with one egg, on toast with a laughing cow cheese spread, topped with salsa and an orange. It’s delicious. Remember, breakfast needs 3-5 food groups to be balanced. Salsa is only considered a veggie serving if you eat about 1/2 cup (that’s a lot)! And the laughing cow cheese spread isn’t enough to be a full dairy serving (but it’s delicious)! Breakfast Bowl. So easy, so delicious. So easy, full of goodness to fuel my day. Turkey sausage gave me a protein choice + the fat (because it's still sausage). Toasted wheat English Muffin for a fiber rich carb. Sausage typically is not protein "packed" so I paired it with a Greek style yogurt to give me another protein source with a variety of nutrients not found in adding more "sausage" to the plate. The grapes gave me a fruit. Duh. A balanced breakfast has 3-5 different food groups.